White paper on crime 2001 Part 1/Chap.1/Sec.1/1. Fig. I-1 shows the trends in the number of reported cases, the number of persons cleared, and crime rates (the number of reported cases per 100,000 persons) for penal code offenses and penal code offenses excluding professional negligence in traffic accidents in Japan since 1946 (see Appendix I-1 ). 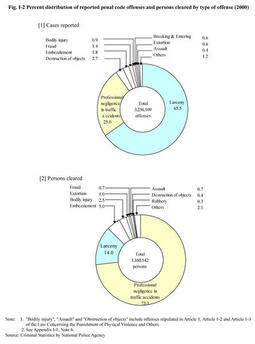 Table I-1 shows the number of reported cases, crime rates, the number of cleared cases, the number of persons cleared, and clearance rates for penal code offenses in 2000 by type of offense (see Appendix I-2 ). The number of reported penal code offenses has increased more or less consistently since 1975, and it recorded a new postwar high of 3,256,109 (an increase of 12.1% from the previous year) in 2000, surpassing the 3 million-case mark for the first time. Fig. 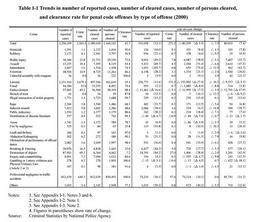 I-2 (i)shows the number of reported penal code offenses in 2000 by type of offense. 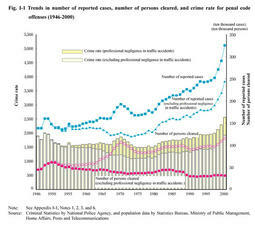 Crime rates for penal code offenses, which have been on the rise since 1978, recorded a postwar high of 2,565 in 2000. Crime rates for penal code offenses excluding professional negligence in traffic accidents have been more or less consistently increasing since 1974, reaching 1,925 in 2000. The number of persons cleared for penal code offenses has been generally on the rise since 1992. In 2000, it increased by 80,035 (7.4%) from the previous year, registering a new postwar high. Fig. I-2 (ii)shows the number of persons cleared for penal code offenses in 2000 by type of offense. By gender, among the persons cleared for penal code offenses excluding professional negligence in traffic accidents in 2000, 246,271 were males and 63,378 were females. In 2000, the number of persons cleared per 100,000 persons aged 14 and over was 464.3 for males and 112.0 for females. Clearance rates for penal code offenses have been on the decline in recent years. In 2000, the clearance rate was 42.7% for the total penal code offenses and 23.6% for penal code offenses excluding professional negligence in traffic accidents, which failed to reach the 50% mark and the 30% mark respectively for the first time after the war, both recording postwar lows (see Appendix I-3 ).